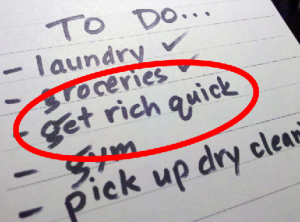 Stop Trying To “Get Rich Quick”! The internet is a weird & wonderful place… It’s a fantastic resource for information & it provides amazing opportunities for people to earn money. And as more & more people are getting online the whole “work from home” thing is becoming increasingly popular and thousands of people every day are quitting their jobs to live the dot-com lifestyle. But this success didn’t fall into their laps and too many people seem to think that when it comes to making money the internet is some sort of magical wand. Don’t get me wrong it’s a fantastic tool to make money & if you know how then it is pretty easy – but it’s not going to happen overnight (at least not for the majority of people anyway)! Because unfortunately that’s just the way the world works. “If you want to get something out, you’ve got to put something in”. I’ve come across too many people lately who are looking for automated, overnight ways of making money… I mean come on, that’s ridiculous. If there was such a thing then the whole world would be using it! Sure, you can build an automated income – but it takes time and it takes work. So whilst this blog post is kind of ranty (I’m making words up), hopefully it get’s the point across about the importance of snapping out of this “get rich quick” mentality. If you do have that mentality then chances are you’re going to get burned, lose a lot of money & not get any further forward… So in essence despite my “rantyness” (yep still making words up) I’m trying to help you out here. I’ll admit that when I first started out online I had a similar mentality, but looking back I was doing nothing but jumping from product to product & wasting cash that I couldn’t really afford to waste… I was chasing silver bullets. But most importantly you’ve got to treat it like a business. Going in half hearted won’t get you anywhere. If you want to build an income online then there are more than enough opportunities available but you’ve got to be serious about putting the effort in to get it off the ground. It can be difficult when you’re at home & there are so many distractions but it’s vital that you find the willpower to put some time aside towards building your online business. Whether it be 1 hour a day, 2 hours, 4 hours or more – all these efforts build up as long as you keep them consistent. It might take a week, it might take a month or it might take a year, but if you keep consistent efforts then one thing is for sure, one day it will happen. If you can adjust your focus to the longer term & picture a goal then work towards it, you’ll succeed… No ifs or buts, you WILL succeed. Easy, because success has a recipe & providing you add the right amount of each of the ingredients you can’t go wrong. Long term focus (picture where you’ll be this time next year & work towards it). Providing you follow that recipe you can’t fail (seriously – you can’t). You see there’s no such thing as failure – failure is merely the name given to people that quit when they reach an obstacle in their journey to success. Every obstacle can be overcome, so if rather than quitting you work out a way around the obstacle then you never failed, because you still went on to succeed. Basically, don’t be a quitter – nobody likes a quitter. Don’t get me wrong, automated incomes DO exist – but you’ve got to build it yourself. Once you publish enough content you begin to get a stream of visitors (AKA traffic) flowing through & traffic is the key to making money online… Once you’re generating traffic the internet is your oyster. That’s where the automated income comes from, because now regardless or not as to whether you publish new content your old stuff will still be generating traffic (and money). From there it’s simply a case of scaling things up by adding more content to generate more traffic, and of course more traffic = more money. Hopefully this post has enlightened you on the importance of treating your online business like any other business & focusing on a long term vision as opposed to short term benefits. If you want to make money online then it’s most certainly achievable, literally anybody can do it. I for one used to work as an electrician and everything I know I’ve taught myself… It’s just all about how badly you want it & how willing you are to make it happen. Everybody is equal, successful people are just those with the mindset to go out there & get the things they want (and they won’t stop until they get them!). It could be you… This time next year you could be making in excess of $10,000 and living the dot-com lifestyle, but the question is are YOU willing to make it happen? I’ll let you decide – but if you are, take my advice & use a system that’s proven to work. It’s much easier than trying to figure out everything for yourself & wasting money during the process. One Response to "Stop Trying To “Get Rich Quick”!" How’s this all going to work if the economy keeps raising the price on goods and keep making things unaffordable, 70% – 80% of anyone’s cash working for less then 15$ is considered food and rent money those people work hard for their living and unless they live with someone or find a spouse they won’t be able to do what they want on their own spare time. Working to just live makes me feel like a caveman I might as well spend my time shooting animals and making my own food then breaking my back at work. I know it’s location, excuse this excuse that. It’s all just a poor excuse to make money more valuable to make the government make more. But if I can’t live on my own be able to eat 3 decent meals a day and can’t afford standard cable while I work 5 days a week at 8 hours a day is a waste of my time. The cost of living needs to go way down, and it’s about time people stop learning to just go with the flow and we do something about being slaves to the industry.